Bww TV: Fall in Love with Broadway-Bound Amelie with a Sneak Peek! Meg Johnson: Nobody with a dream should come to Italy. No matter how dead and buried you think it is, in Italy, it will rise and walk again. Q: What happened to Clara to cause her mental impairment? Q: What make was that cute little white car that Signor Naccarelli was driving? Q: What did Clara pick off the church steps and eat? As she got older Olivia DeHavilland picked and chose her roles a lot more carefully. An absence of three years such as the one she had before accepting Light In The Piazza was not unusual for her. I think it was in part a reaction to her days at Warner Brothers where she was put into a whole lot films she didn't like. At the time she made Light In The Piazza Olivia was living in France with her then husband Pierre Galante and raising their children. So a location shoot in Rome and Florence was no big move. Rome saw its share of films extolling the beauties of the Eternal City. But in this one the Renaissance beauty of Florence got its share of cinema immortality. 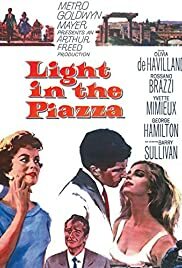 The color cinematography of Light In The Piazza was its greatest asset. Olivia is on a mother/daughter holiday in Florence with Yvette Mimieux who when she was 10 was kicked in the head by a horse and has stayed at that age emotionally. But her physical development wasn't arrested any and she gets the attention of young Florentine George Hamilton. There's a whole lot of concern from both families because Hamilton is the same way. In addition to her daughter's romance, Olivia gets courted by Rossano Brazzi who is Hamilton's father. Some of the plot of A Summer Place is borrowed here as we glimpse into their married lives, Brazzi with the eternally crying Nancy Nevinson and DeHavilland with stuffed shirt Barry Sullivan who wants to institutionalize Mimieux because she's becoming an inconvenience. Light In The Piazza got an Oscar nomination for Best Sound. It was produced at MGM by Arthur Freed who was now out of the musicals business. Still this film has some of the decorative gloss that an MGM Freed musical you would expect to have. Yvette Mimieux may have given her best screen performance here. I think you'll agree.